Japan's southernmost territory of Okinawa became part of the country, as Okinawa Prefecture, in 1879, just a few years after the Meiji Restoration (1868). Up until then, the archipelago, a string of islands in the East China Sea running down toward Taiwan, was an independent nation, albeit with tributary relationships, at certain periods, with China and the Satsuma clan in Japan. It also took advantage of its convenient location to become a key trade hub, its merchants buying silks and ceramics from China and selling them to Siam, Java and Sumatra while bringing in pepper, ivory and other precious goods from Southeast Asia. This legacy lives on in the region's potent awamori sake, still today made with long-grained rice from Thailand rather than the Japanese short-grained variety. Since the war, Okinawa's internationalism has been defined by the US military bases that dot its main island, but in the last few years its strategic location has been utilized for the more culturally edifying purposes of an international film festival. A relative newcomer to the circuit of Asian film fests, the Okinawa International Movie Festival held its fourth edition this March. The festival is organized by the entertainment and production company Yoshimoto Kogyo, who specialize in comedy shows for TV and screen, a priority reflected in the festival's theme of "Laugh and Peace". Something of a misnomer, the movie festival is more like a matsuri, featuring live comedy performances, fashion and live music shows and various other events in addition to films. Across seven screens the festival showed 85 feature length films and 21 shorts from around the world and particularly from Asia (including Korea, Malaysia, Thailand and India) as well as a large number of Japanese productions, many, inevitably, by Yoshimoto itself. Produced by the company in collaboration with Asahi Broadcasting Corporation is the comedy-drama The Bridal Night and the Lotus Root (directed by Masahiro Yamaguchi). The viewer's suspension of disbelief is severely tested when the adopted daughter of the family is brazen enough to ask the father if he and his wife have ever actually got it on, but once over that first hurdle the film offers an interesting angle on the contemporary social phenomena of sexless marriages and hikikomori (the socially withdrawn). Revealing that the girl's boyfriend, and handsome catch of a doctor, is secretly redefining the word "examination" in his after-hour consultations with his female patients, the film shows that it is actually her withdrawn otaku brother who can truly see people for what they are. While, like the acting in many Japanese comedies, The Bridal Night and the Lotus Root over-eggs the pudding at times, if anything the style is understated in Chips (Potechi). Directed by Yoshihiro Nakamura (of Golden Slumber and Fish Story fame), Chips concerns the mysterious Kurosawa who doesn't like snack food and says he can't empathize with people, and Tadashi, a young burglar – and a bit of a loser – who perhaps empathizes too much. Blackmail and attempted extortion drive the plot, but the film is essentially about identity issues, emotional connections and disappointed hopes. The film is set and filmed in Sendai, although nothing is made of last year's massive tsunami that wrecked some of the coastal areas there, and revolves around Tadashi's unusually close interest in a talented baseball player from his hometown who has been left on the benches of the local team. While it seems Tadashi may just be over-identifying with the player who shares his exact birthday, the story unfolds to reveal more beneath the surface. Nao Omori (of Ichi the Killer fame) is particularly commended as the stone-faced Kurosawa who helps Tadashi learn more about himself, in what is one of the more accomplished Japanese productions to premier at the festival this year. 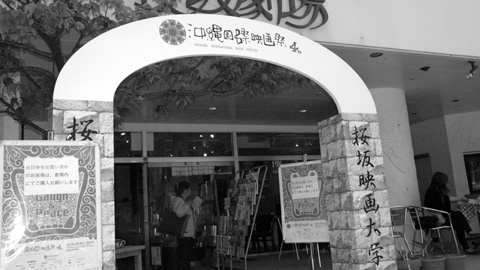 Like many films in the festival, Chips could be viewed either at one of the four screens in the main venue, a conference center in Ginowan, or one of the three halls of the Sakurazaka Theatre, an independent cinema in Naha, the capital of the main island. Yuji Nakae, the owner of the cinema and the director who put Okinawa on the cinematic map with Nabbie's Love (1999) and Hotel Hibiscus (2002) spared some time to discuss the state of filmmaking on the island. Before Nakae made Okinawan culture the focus of his work, the prefecture had very little cinematic representation, the one figure notable for putting Okinawan culture on the screen being Go Takamine (also known as Tsuyoshi Takamine). "Okinawa locals look up to Takamine, but his films didn't receive much attention outside the prefecture," says Nakae, "even local people did not necessarily understand his films. His Untamagiru for example, is based on a local legend, but is a very personal interpretation of it." Nakae's own Nabbie's Love was, according to the director's figures, seen by 180,000 people across Japan: "The film changed the movie landscape for Okinawa. But after the boom was over, directors from Okinawa had to ask themselves some essential questions." With few resources on the island, many aspiring filmmakers feel the need to move outside the prefecture to prosper, although some have stayed, such as Tsukasa Kishimoto, who works under Nakae while also doing television work. Nakae himself relies on the mainland for funding, which is raised by his Tokyo-based producer, but has not been tempted to move there himself (he is originally from Kyoto). Nakae seems upbeat, adding that although there was only one new production from the island entered in the festival this year, in previous years it has screened more Okinawan films. The film he refers to is Hi-zai - "hello" in the Okinawan dialect - directed by Shuhei Fukunaga and Masahiro Izuo. Set in the trendy shopping and entertainment area of Depot Island, the film chronicles the adventures of two women who come to Okinawa from the mainland: one is with her new boyfriend, attempting to forget her old flame, and the other, in the act of stealing some jewellery from a shop, is mistaken for the store's owner and kidnapped by a yakuza punk. The film struggles somewhat to keep its various threads together, although any film with a sullen shoplifter, a gangster with a cleanliness fetish and a bunch of schoolgirls experimenting with a ouija board has set itself a hard task. The film was created by one of the few production companies on the island, Sugar Train, who successfully entered films made by local talent into previous editions of the Okinawa International Movie Festival, including A Song of Gondola (Naoya Oshiro) in 2010 and See Me? (Toma Hayashi) in 2009. Although the focus of the festival is on new releases, there were also plenty of past films being screened, many with new prints, from old Ultraman and Tora-san movies to a limited retrospective of two films by Yoshimitsu Morita, who passed away last year, (Something Like It and The Mamiya Brothers were screened). It would be interesting to see if this part of the festival couldn't be utilized to run, for example, a program of documentaries from or about Okinawa, to leverage the local angle a little more. Yoshimoto Kogyo is actively helping to provide Okinawa with more opportunities to shine, although Hiroshi Osaki, the president of the company, remains modest, saying "We simply hope that the festival will help foster an interest in working in the film and TV sectors by exposing young Okinawan people to how the industry works." In fact, the company has also been touring schools in the prefecture over the last two years holding workshops on various aspects of the business as well as opening a college teaching production, singing, comedy and other related skills. Okinawa being so close to Asia, Osaki also says he hopes to see more exchange students from across the region coming to the prefecture to study the craft. Films made by, or in, other regions of Japan, however, were quite numerous, including feel-good shorts offering a peek at the local flavor of areas from Mashiko, just an hour or so from Tokyo, to Hokkaido in the far north. The latter, Yuki Monogatari, involves a character played by Kanna Mori, relocating to take up a job in a backwater Hokkaido town, insufferably cold and socially claustrophobic, as she is soon roped into going drinking every night with a volunteer group, listening to their same old jokes. Tasked with leading the group in making sweets for the local "Snow Town" community festival, her new role leads to the inevitable overcoming of the tensions within the office through solidarity and group effort. With the country facing not only unprecedented economic challenges but also the effects of the previous year’s triple disaster, such uplifting films promoting harmony and positivity (the "peace" angle of the festival's theme, perhaps) can be seen to reflect an effort within the wider culture to revive the nation's spirits. Addressing the effects of last year's devastating earthquake more directly, however, are several documentaries, including Pray for Japan, directed by Japan-based American Stu Levy. Also included was the anime A Letter to Momo enjoying its first showing in Japan after its premier at the Toronto International Film Festival last year. The film includes voicing by actor Toshiyuki Nishida and is the first film in thirteen years to be directed by Hiroyuki Okiura, of Jin-Roh: The Wolf Brigade fame. 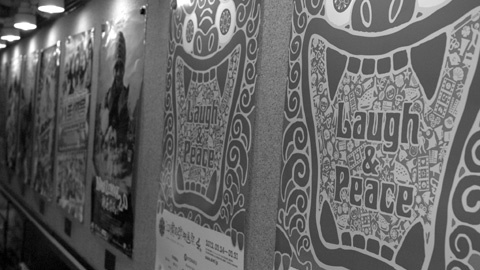 The "laugh" aspect of the festival's motto is of course self-evident with the high visibility of comedies, such as Ah! Minister! (Daiya Goriki) - one of that rarest of creatures, the Japanese political satire. The huge 25 by 14 meter screen, brought in especially from Sweden and set up on the beach, was considered a good opportunity to show last year's Scabbard Samurai (Saya Zamurai) directed by the ace up the Yoshimoto sleeve, Hitoshi Matsumoto of comedy duo Downtown and director of Big Man Japan and Symbol. Scabbard Samurai is a quirky jidai-geki comedy with often deadpan humour. Naturally, laughs abounded even the presentations of many of the films with comedians such as Takashi Fujii (game show host "Mathew" from Lost in Translation) introducing screenings. In some instances, such as the showing of Dreamgirls, a team of Yoshimoto's comedians even added running comedic commentary on the mic during the entertainment itself - a quirky Japanese experience resurrecting the spirit of the benshi narrators of the silent film era and just one of the ways the Okinawa International Movie Festival is creating its own identity.